via Israeli children’s book illustrator sues Habima for copyright violation over production – Israel News – Haaretz.com. Whilst the theatre appears to have collaborated with the author (Yannets Levi) on the production, this seems not to have been the case with the illustrator. The so-called Battle of the Monsters has proved a canny and lucrative winner for independent publisher Andersen Press and past laureate Chris Riddell. Andersen Press has seen unprecedented reaction to their marketing campaign, with over 4,500 copies of the book leaving their warehouse before Christmas, the number of orders of the book 9,582% higher in November 2017 than the previous month. Support across the trade has been incredible, with book shops up-and-down the country tweeting support and ordering in copies to capatalise on the media interest. Andersen Press created special Mr Underbed posters which over 500 shops received. 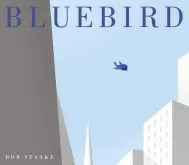 I love wordless picture books, but this one is shocking in its blatant plagiarsim of a famous short French film about a red ballon from the 19650s.